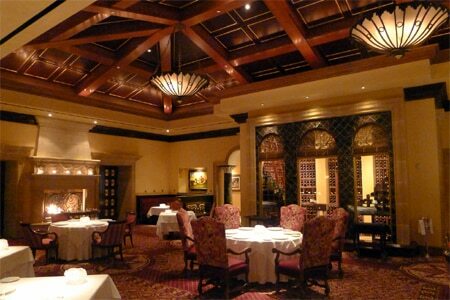 Exceptional, seasonal haute cuisine in a lavish European-style setting at Fairmont Grand Del Mar resort. • For more about Addison restaurant, read GAYOT.com's blog. Dinner Tues.-Thurs. 6 p.m.-9 p.m., Fri.-Sat. 5:30 p.m.-9:30 p.m.
About the restaurant and décor: Addison sits regally overlooking the verdant fairways of Fairmont Grand Del Mar. Soft lighting, professional service, fine cuisine and opulent décor make for a sensory evening. Thoughtful attention to detail can be found in every corner, from the 22-carat gold leaf etchings in the ironwork to the inlaid limestone and aubergine marble flooring. About the food: Thanks to his dedication and research through his personal collection of vintage cookbooks, executive chef William Bradley continues to create innovative recipes. Guests are invited to tailor their own four-course tasting menu ($110) or opt for the multi-course Chef's Tasting menu ($250). Dishes pay respect to the purveyors, built around whatever produce is at its peak, shifting both seasonally and perhaps weekly. Foie gras pot de crème with passionfruit gelée and chocolate brioche is a menu mainstay, but guests might also encounter caramelized sablefish with toasted kale, scallion and bouillon japonais; duck à l'orange with pistachio, beets and blanquette d'endive; and vacherin "tropicale" with coconut, caramelized pineapple and mango sorbet. The cheese cart, featuring a simple but attractive and fragrant assortment, is yet another highlight of the experience. About the wine: Options on the 38,000-bottle wine collection, managed by Rafael Sanchez, may range from Austria's 2006 Loimer "Lois" at $45 all the way up to a 1982 Château Pétrus just shy of $13,000. If you're fond of bubbles then you must have the Champagne, which is specially made for Addison. Corkage is $75 per bottle (limited to three), provided the wine is not on the restaurant's list.